One of the first books I read as a graduate student was Edward R. Tufte’s The Visual Display of Quantitative Information (from 1982; i.e., the social scientist’s coffee table book). Tufte argues that graphics reveal data and therefore should, “avoid distorting what the data have to say” (p. 13). In one section of this classic Tufte writes, “Each part of a graphic generates visual expectations about its other parts and, in the economy of graphical perception, these expectations often determine what the eye sees. Deception results from the incorrect extrapolation of visual expectations generated at one place on the graphic to other places” (p. 60). No religious group? Really? 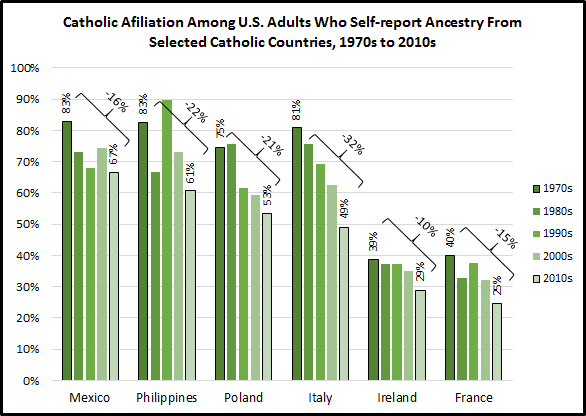 White Catholics? Asian, mixed-race, and other race Protestants? See what is done here? 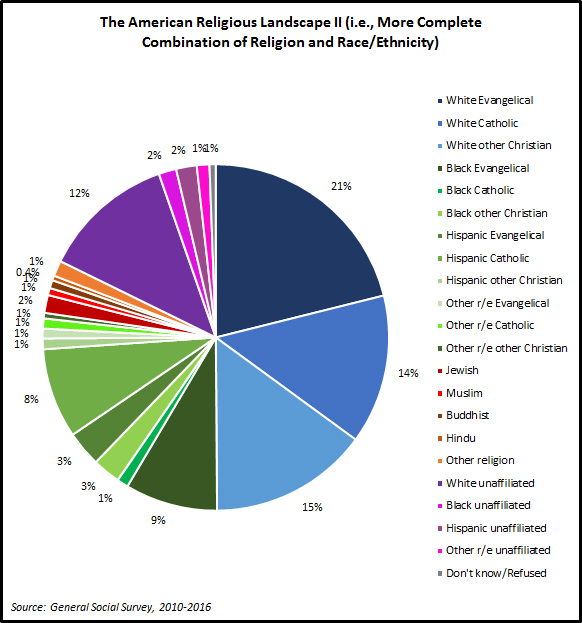 I could perhaps see a legitimate historical argument to specifically measure members of Black Protestant denominations (e.g., African Methodist Episcopal Church, National Baptist Convention, USA) but people who identify their race as Black of African American and their religion as Protestant or Christian are not necessarily members of any of these churches. 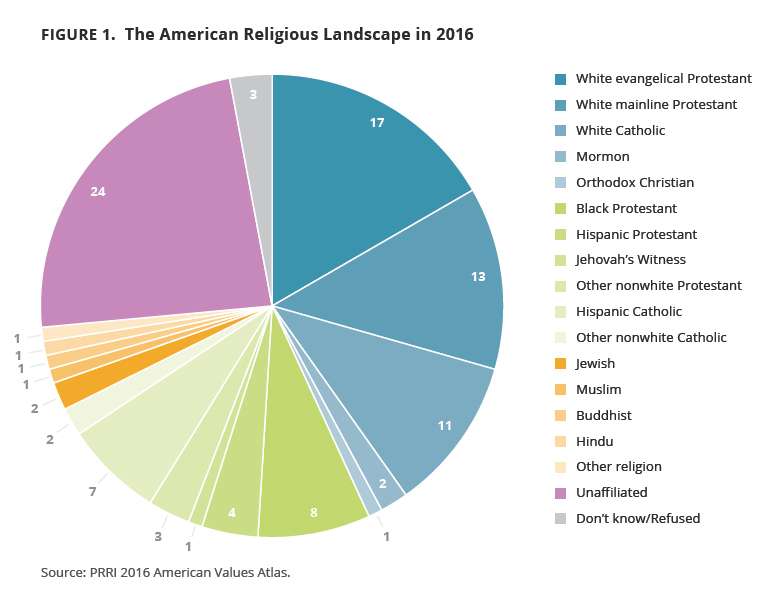 It is true that pollsters often show results within religions for sub-groups (e.g., gender, generation, race and ethnicity, income) but they don't define these sub-groups as separate religious groups themselves (Look at PRRI's American Values Atlas and you'll see more of this odd segmentation). 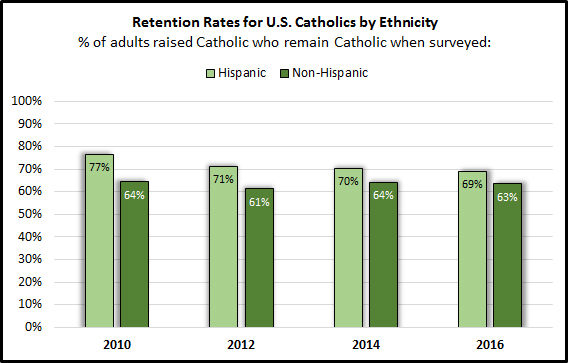 The racial and ethnic division of Catholicism in the graphic is especially bizarre. 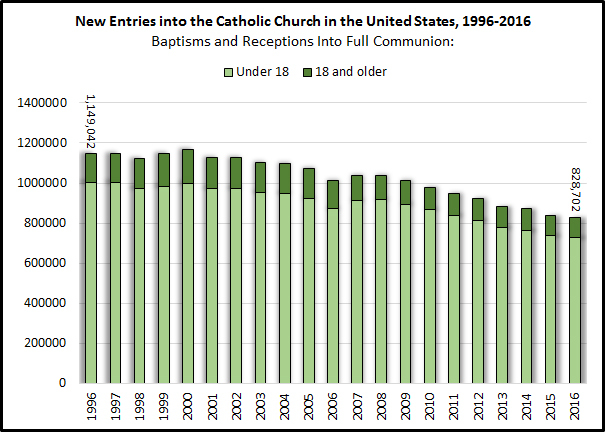 Catholicism is a global faith and that diversity is represented well in the United States. 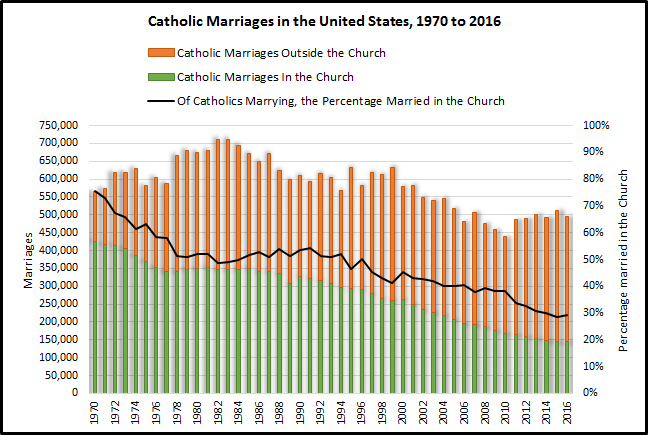 CARA does in-pew surveys in parishes around the country. We’ve needed to translate these into 20 languages. In some cases we’ve distributed surveys in three or four languages at one parish. 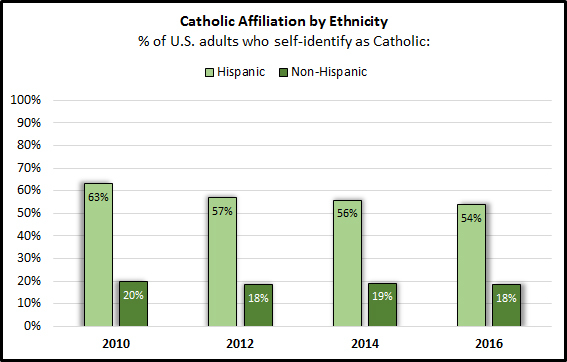 Pope Francis is the pope to “white Catholics,” “Hispanic Catholics,” and “other nonwhite Catholics.” They all share the Mass, sacraments, Catechism, Canon Law, etc… Hispanic Catholics are not a different “religious group” than White Catholics (…to be a real stickler for details, in the 2016 General Social Survey, 55% of Hispanic or Latino Catholics self-identified their race as white. Hispanic or Latino is ethnicity). Rather than the unaffiliated all being some universal “none” stereotype, some are perhaps more appropriately described as evangelical “dones” (For more about the concept of “dones” see Josh Packard and Ashleigh Hope’s Church Refugees, 2015). 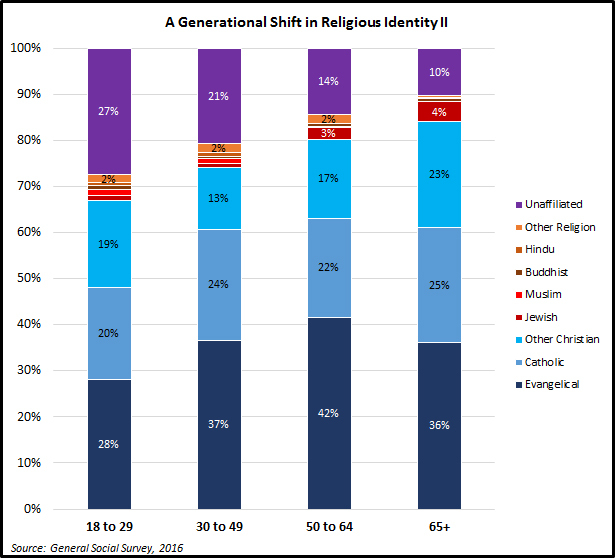 These are people who may have left behind the brick and mortar of traditional organized religions for more personal and local expressions of their Christianity. 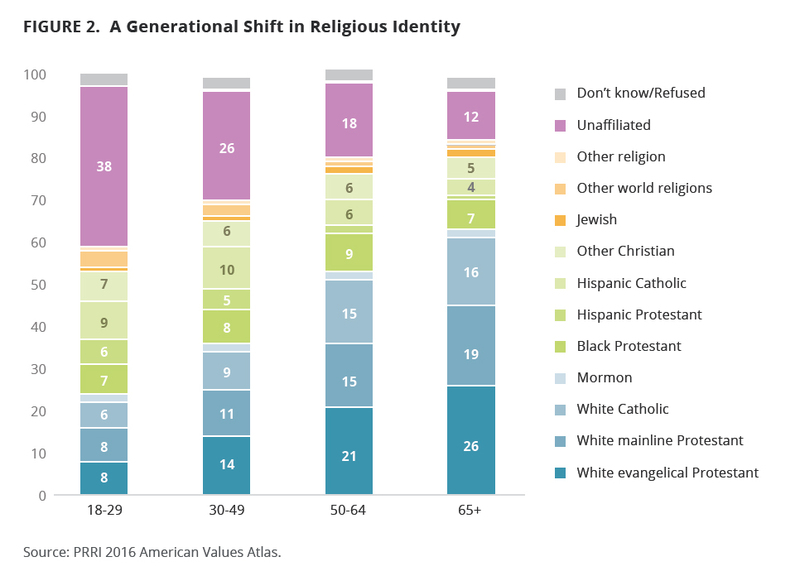 They don’t think of themselves as members of a religion as much as they might see themselves as believers within a specific local nondenominational church and/or community. 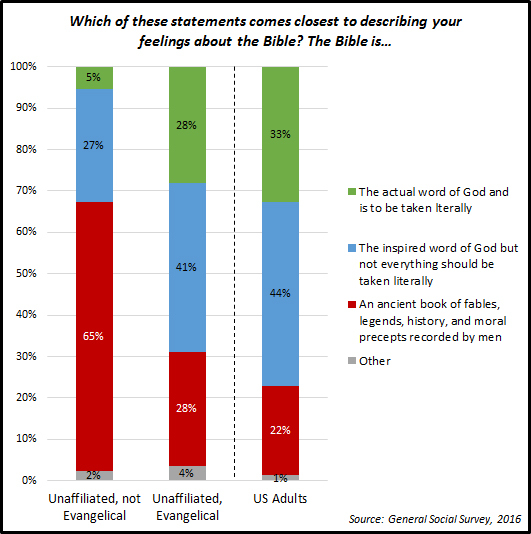 Then again, perhaps these respondents are just misunderstanding or incorrectly answering the evangelical question (…the GSS question itself could use some improvement)? 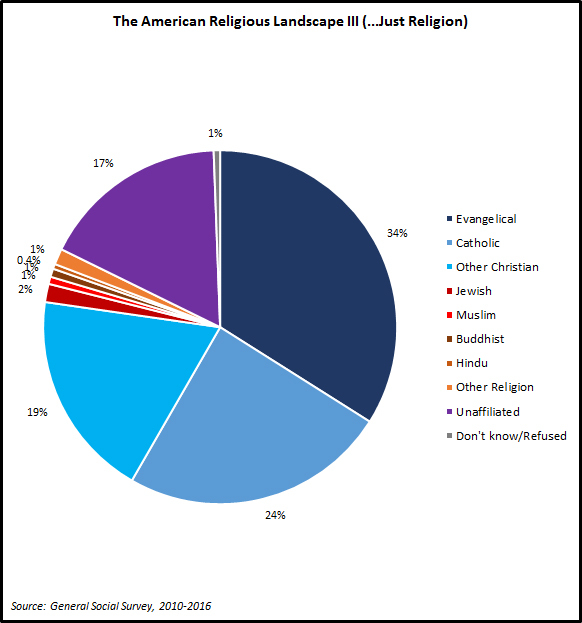 We can compare the unaffiliated with the “unaffiliated evangelicals” to see if there are any differences on religion questions. 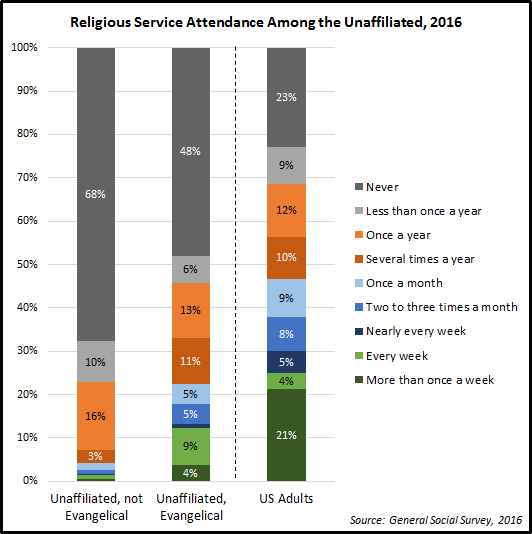 As shown in the figure below, 94% of the unaffiliated who are not evangelicals attend religious services once a year or less often. By comparison, 67% of the unaffiliated evangelicals attend this often. While they do not match the attendance levels of the typical U.S. adult, there is clearly something different going on here. Seventy-four percent of unaffiliated evangelicals believe in God and an additional 15% believe in a higher power. Just 7% are agnostic and 4% atheist. 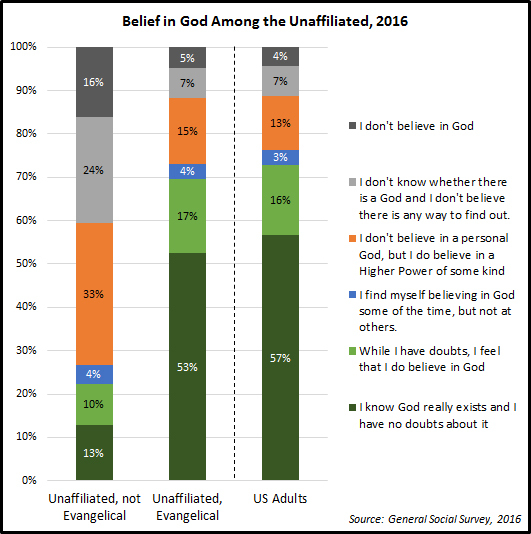 By comparison only 27% of the unaffiliated who are not evangelicals believe in God (33% believe in a higher power, 40% are atheist or agnostic). 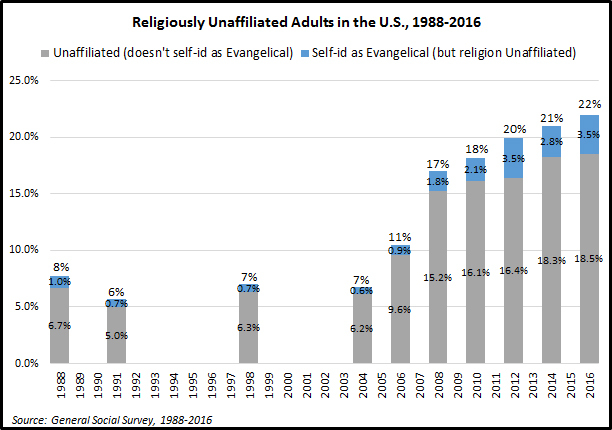 Unaffiliated evangelicals look very similar to the typical U.S. adult in terms of belief in God. The unaffiliated who are not evangelicals do not look similar at all in this regard. 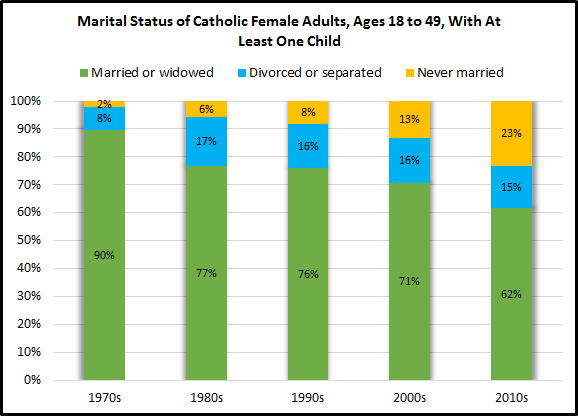 While some researchers and the media more generally have taken to equating the unaffiliated or “nones” as a distinct group lacking in religiosity there are more interesting realities in the data. 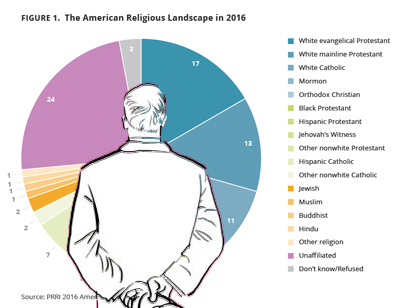 I’m not sure if this sub-group(s) is really the “slice” of the religion pie that it is portrayed to be by the PRRI graphic. It is by no means larger than any “religious group” in the United States. 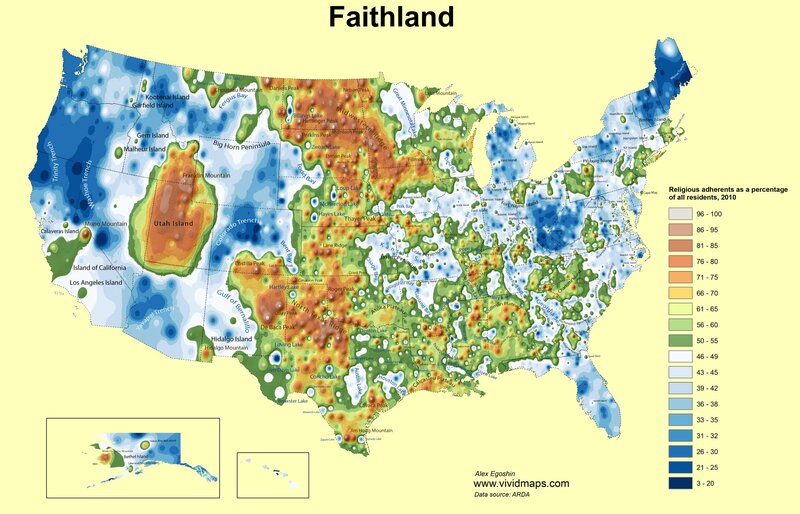 The Faithland graphic shows land where adherents make up 50% or more of the Census population. The water areas are places where 51% or more of the population in an area are “unclaimed” by congregations. 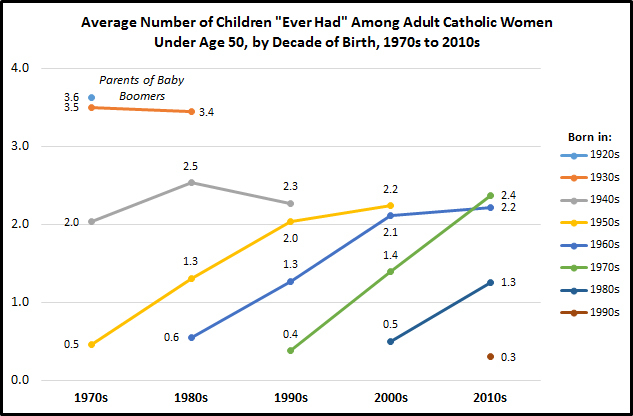 The graphic displays the data in a compelling manner. At the same time, there are two things that I think the general public, who are sharing and viewing the map, are generally unaware of. Knowing these might alter their interpretations. Second, I’m not sure how areas where no one lives are treated in the mapping. 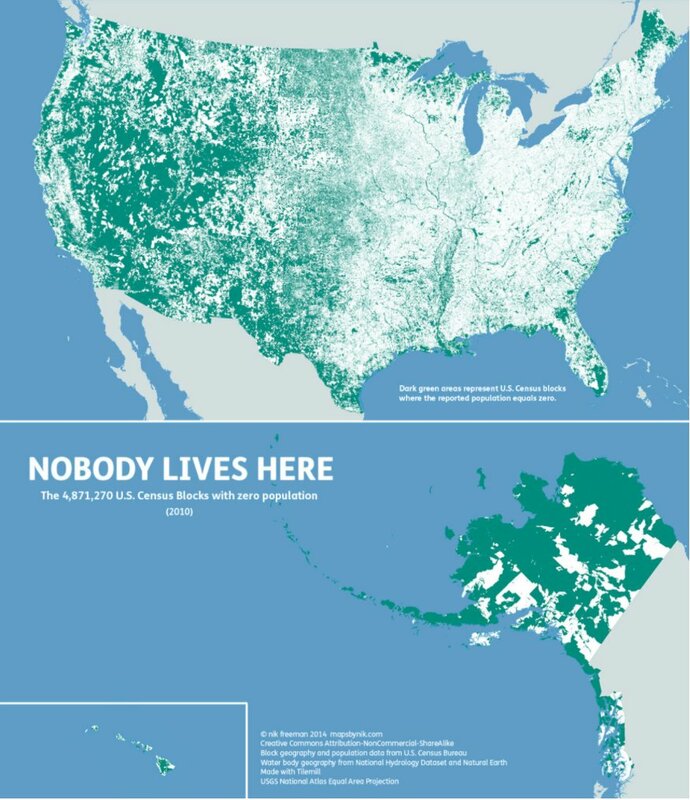 The size of these areas in the country are larger than one may think (see below... more commentary here). 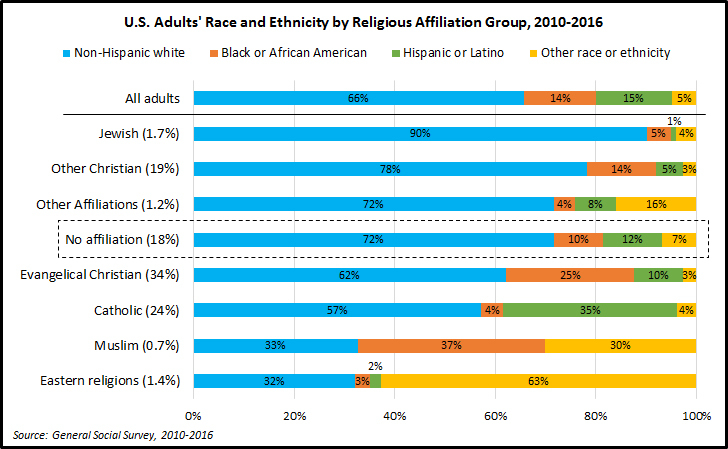 The Religion Census data are reported at the county-level. However, the map is not displaying counties and some sort of smoothing is being used that viewers are likely unaware of.